The HHP-2000 Series handheld air pressure meter is designed for one-handed industrial or laboratory use. The custom molded case allows this manometer to withstand continual heavy use and operation in industrial or humid environments. Each unit has a high contrast liquid crystal display with a backlight feature, which allows readings to be seen in all applications. All of the differential models can measure gauge or vacuum pressures, as well as differential, by venting the low and high ports to atmosphere, respectively. Each unit is autoranging, which offers the greatest resolution and accuracy. There are three models to choose from. The HHP200x is an inH2O unit with zero and hold functions. The HHP202x has the above features plus 10 selectable units, min/max, range lock, and smoothing. 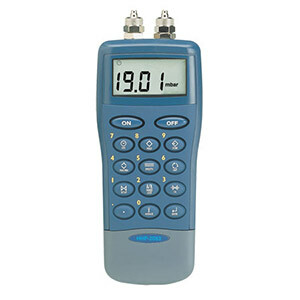 The HHP208x has the selectable unit’s features plus averaging, leak testing and datalogging features. Datalogging features enable readings to be taken (up to 250 points), stored, retrieved and downloaded. Two modes are available: logging on demand, and preset interval logging from 1 reading per minute to 1 reading per 24 hours.